Look at the contestants, Niketan the chugli cunning, Rajeev the cheat and womanizer, Delnaz the cry baby and bad looser (once said WTF I am the only person who deserves to win), Urvashi the vamp (schemer plotter and typically one sided approach who sleeps most of the time), Sana (the lady without brains like a blonde who says Vishal is her friend then involved in a pati patni aur woh. She is the spoke in the broken marriage and gives a poor image of herself). and finally Imam who depicted reality the anger, the emotion, the courage, the humility, the entertainer. What more do you need to judge BB. Its your call and prove that BB means which personality? Imam is the only one whoz running the show now , rest of them have nothing to do other then talking about Imam in house . Imam is the only one who has shown his talent in all the fields and he is also strong enough to stand against every one in house and still survive . Rajeev ... what a looser he is .. Sana knows nothing other doing make up and playing stupid games with that "choosa hua aam" so that he does nt nominate her to be evicted. Delnaz has no time do anything to entertain viewers coz she is busy wid sorting her personal issues in house in gain sympathy. urvashi & Niketan have no contribution towards the show. Cler cut winner for this season is only Imam if not then show is biased. If Imam wins, it will be a big slap to goodness and kind behavior, it will be a big slap to Salman Khan himself (remember he "timed out" Salman too!). Yes he has been targeted by Rajiv/Urvashi/Sana etc, but then, he called for it by his irrational behavior with each one of them. With Rajev Paul gone, who has a better chance at the Rs 50 lakh prize money? Remo D'Souza and Prabhudeva shake a leg. It's a treat to watch the two perform. Salman Khan joins Pabhudeva and Remo D'Souza. Now, that's what we call a performance. Salman Khan learns popping from Remo D'Souza. Prabhudeva is back with 'Muqabla'. Get ready to see Karishma Kotak dancing in a swimming pool with Vishal Karwal tonight. 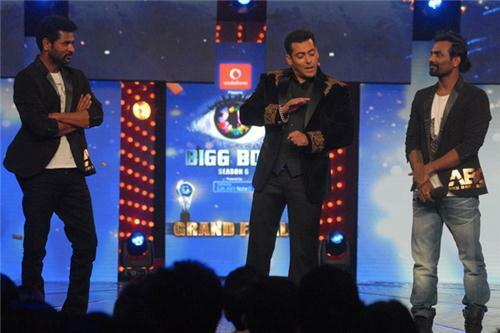 Salman and Remo perform the moon walk on Bigg Boss. Salman helps Prabhudeva with his Hindi. Imam's favourite lingo: Chalo bolo, London. Retweet if you think Imam will win the show. 'Ullu Banaya Bada Maza Aya', 'Dellu', 'Time Out','Chalo Bolo London'; Bigg Boss 6 trends. The Gulabi Gang leader should change her name from Sampat Pal to Shampy. Looks cool! Shamp says sari se taakat nahi aati. Shampy can't take one name. 'Ye mujse nahi hoga'. Vishal and Karishma decode 'Ishq wala love'. Gulabi Gang leader Sampat Pal thinks Imam might win. Karishma Kotak performing a steamy act with Vishak Karwal in the swimming pool of the Bigg Boss house. Karishma Kotak wants Niketan to win the show. Hot Yana Gupta performing a cage act. Yana Gupta in a cage looks stunning. Yana Gupta raises the temperature of the house with her steamy act. Catch Sapna Bhavnani and Nirahua perform on 'Womaniya' on the other side of the break. Tell us how do you find Sapna Bhavnani in a Punjabi attire.